I suppose you could fill the back with specific policy ideas that could help like a financial transactions tax, NGDP targeting, state aid, an infrastructure bank, etc. Feel free to suggest other ideas too – those were just off the top of my head. I got the graphs from Kevin Drum and Brad DeLong. That is a great sign! You should hold this sign up somewhere. Maybe the best moment of your lifetime to become the “protesting type”. This movement needs minds like yours. All hands on deck, baby. Hi Dan, Thank you for allowing me to subscribe. I truly do like to get both sides of any story and try to make a balanced evaluation of subject, policies and even opinions. I, too, like your graph sign, but for a different reason than you probably imagine. At the end of the 2010-2011 portion, the graph given you shows the trend arrow plateauing. However, if you look at the graph itself, as you get to the end, there is a hint of a 2nd drop that I was attempting to discuss regarding the Peter Schiff article. I’m not saying that my perspective on the graph is correct; it’s too early to tell for sure, but it certainly seems that from a new and unexpected source, the trend I and Peter described may actually be occurring. 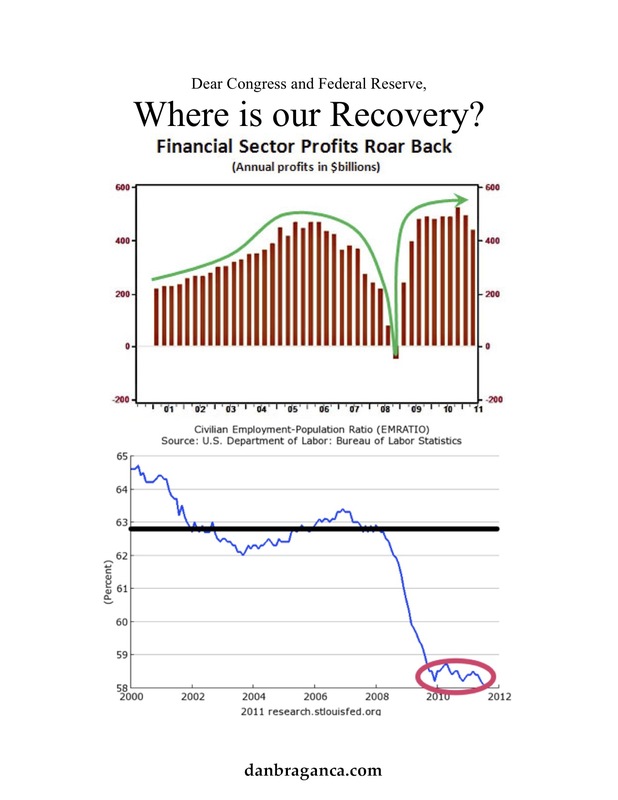 The question, “Where is our recovery?”, I think is also answered by the chart. The financial sector has made a lot of money since the initial drop into the abyss, which many took for a recovery according to varying theories. And, for the business sector, that is true. They are making money. So, you have to ask yourself where are those profits going and why are we not seeing a lowering of the misery index for our fellow citizens. My view is that the money is being made by a shift of investments from the U.S. Markets into foreign markets where currency is strong and policy is more conservative, like Germany, for instance. Perhaps, it is being reinvested in China as well. China is a country notorious for manipulating its currency in order to get and hold a trading advantage over its trading partners; especially, the United States. News and financial gurus cite with regularity that U.S. corporations are holding at least 2 trillion dollars in profits made overseas. Those profits are not being reinvested because of the astronomical loss of value corporations would suffer ,due to U.S. taxation rates, were they to repatriate funds that have already been taxed by the nation they are doing business with. My personal view is that the amount held and out of circulation in the private sector is closer to somewhere in the range of 3-4 trillion dollars. Those private sector funds are the symbol of jobs and their absence from circulation is the reason for limited or negative job growth. This circumstance also contributes to the need to constantly revise economic indicators such as GDP and employment numbers downward on a regular basis in following quarters. The money is being made and jobs are being created; they are just being created and money is being circulated in some other nation’s private sector economy. I don’t blame government completely for this, but neither do i blame business completely. In my view, government intrusions into the economy has put a stranglehold of uncertainty with regard to new taxation increases, new and potentially unsustainable health care cost to be absorbed primarily by private sector entities either as direct expenses or fines, and a myriad of other costly nuances the derive from Frank-Dodd and other misguided regulations. Of course, we also have the problem of USLRB interfering with corporate decisions on the location of new plants such as the Boeing plant in South Carolina for the benefit of unions. And,of course, we have unethical and immoral business entities that acted, in my view, criminally, in some cases with the financial and mortgage industries. However, that also includes the semi-government entities, Fannie Mae, Freddie Mac and to some extent, Ginnie Mae, each of which are still dealing in derivative bundling. Take care, my friend, and thanks again for allowing an old Objectivist time in your progressive cyber living room. I hope I didn’t leave too many typos or other errors. I am too tired to edit and plan on heading to sleep. So, if you will, please forgive any sloppiness your may find. The employment-population ratio graph is ever-so-slightly out of date, the “drop” you see actually tics back up in more recent figures. All of that is to say, we shouldn’t focus on minute monthly changes, but look at general trends. I wouldn’t be surprised if there was a double-dip, but the real problem is the non-recovery recovery. On Germany, I’m not so sure you can classify Germany as “more conservative.” For example, Germany has stronger labor market protections (i.e. “government intrusions into the economy”). Also, that Germany practiced austerity where the US engaged in large stimulus is a myth. I’ll just note as well that your “stranglehold of uncertainty” is a frequent punching bag on this blog. Take care, hope to hear from you soon. I would have to nit pick as well in response to your comments. I think we are seeing similar signs, but we are seeing them ultimately moving in different directions. Perhaps the difference is the result of wishful thinking on both of our parts due to the our loyalties to either Keynes or Hayek. By more conservative with respect to Germany, I was referring to their stance to adopt a more austere spending policy and to relax some regulations to stimulate productivity and growth.. I am aware of the debate from both sides over the “uncertainty” issue and I attribute that to the fact that were we go from here is unknown; we’re all working on the best assumption equal to the limitations of our knowledge. One thing is for certain and that is there is a hell of a lot of investor money on the sidelines and a lot of it has been driving up platinum, gold and silver prices or has been used to short the market. Most of those transactions are being made from overseas and that money is not coming back for some reason…the businesses themselves claim it’s uncertainty among other things. You might have missed the graph in my 2nd link, but Germany did not “adopt a more austere spending policy.” There spending following the crash was higher than in the US. That difference certainly isn’t a “result of wishful thinking” – it’s a simple comparison of facts. It appears you just happen to be mistaken. And finally, just for the record, the number one this businesses are claiming is a problem is poor sales not regulatory uncertainty.